At the Spokane Police Department's request, these signs have been added to the Centennial Trail near Kendall Yards. Few sights in Spokane are as gorgeous as the views from the Centennial Trail in Kendall Yards. It serves as a living billboard advertising some of the city's greatest assets: Its proximity to the river gorge and access to nature. 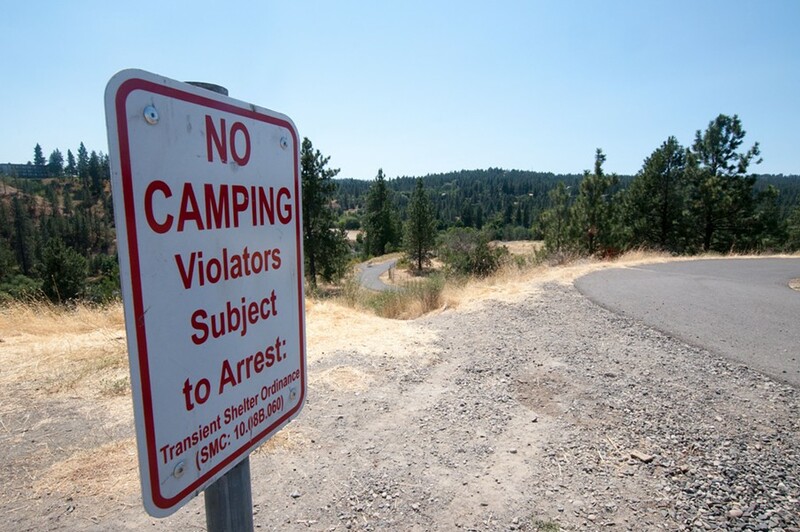 Lately, however, those views also carry an additional message: Transient campers will be prosecuted. 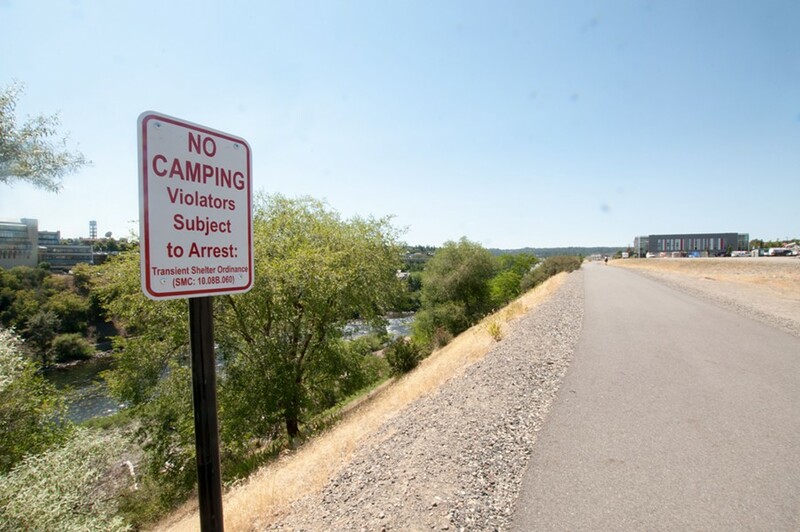 Eighteen signs have been installed on the stretch of the Centennial Trail between the Monroe Street Bridge and the end of Bridge Avenue, all saying: "NO CAMPING Violators Subject to Arrest: Transient Shelter Ordinance (SMC 10.08B.060)." 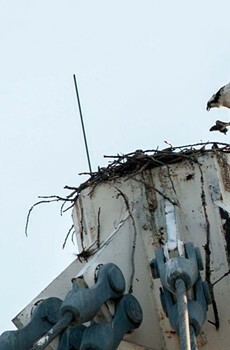 Several signs appear to be less than 100 meters apart, and one sign was even nailed to an osprey nest pole. The Transient Shelter Ordinance has been around a while. The first version was passed back in 2004 on a narrow 4-3 vote, over then-future-Mayor Mary Verner's opposition. Back then, a homeless encampment had sprung up on the grassy median on Riverside Avenue, near the Masonic Temple. The ordinance was last updated a decade ago. 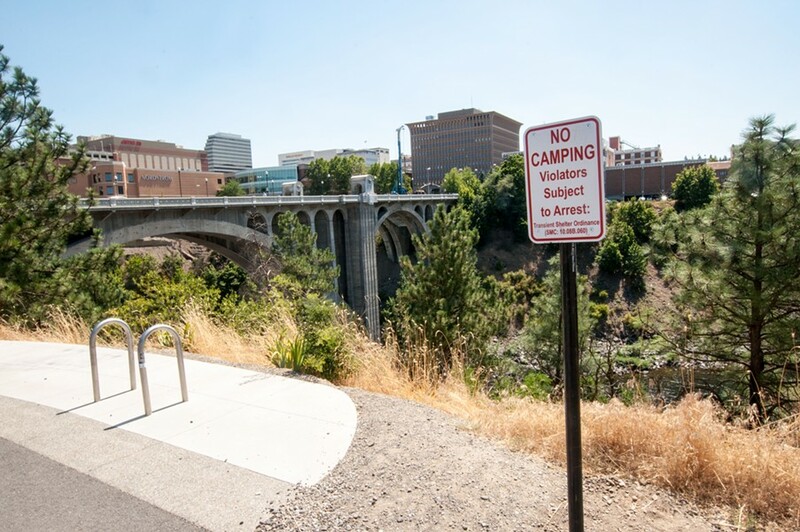 But these particular signs were added after KHQ's controversial report — criticized by the Inlander — two weeks ago on a homeless encampment below Kendall Yards. 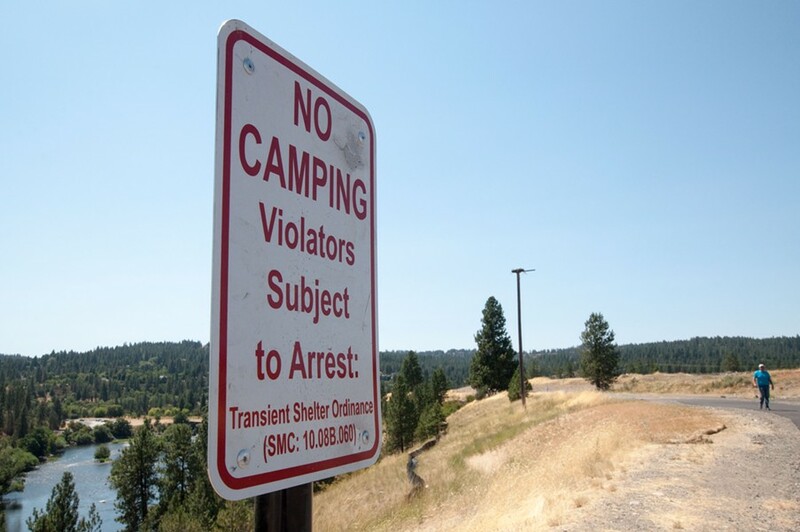 The encampment was busted and the transient campers evicted shortly after the KHQ reporter filed a complaint about the camp with city code enforcement. 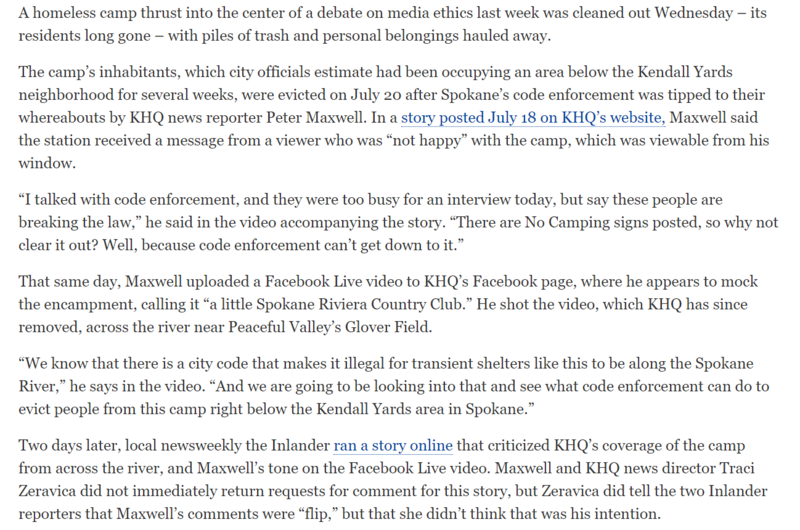 According to the Spokesman-Review, KHQ was the only entity to submit a formal complaint about the camp. 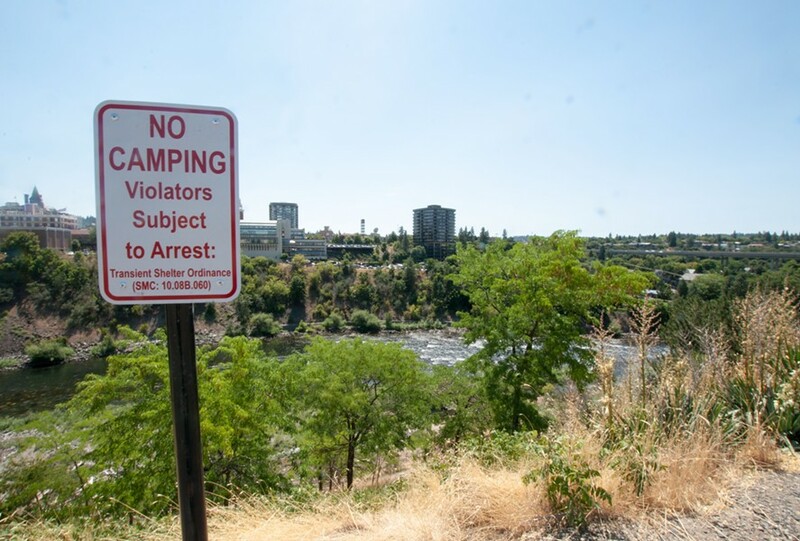 Jonathan Mallahan, director of the city's neighborhood and business services department, says the signs were put up at the request of the Spokane Police Department. Dan Torok, Spokane Police North Precinct captain, says that SPD Sgt. 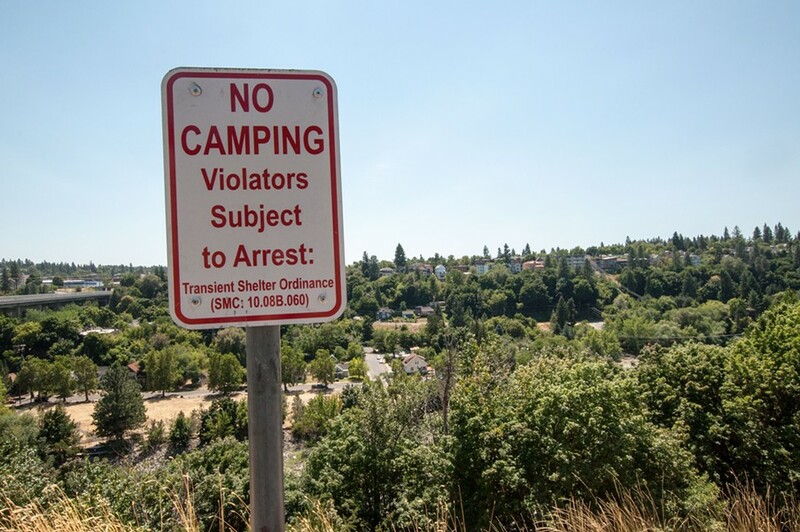 Vic Carroll brought to his attention the fact that the no-camping warning in the vicinity of the homeless camp was out of the way and easy to miss. 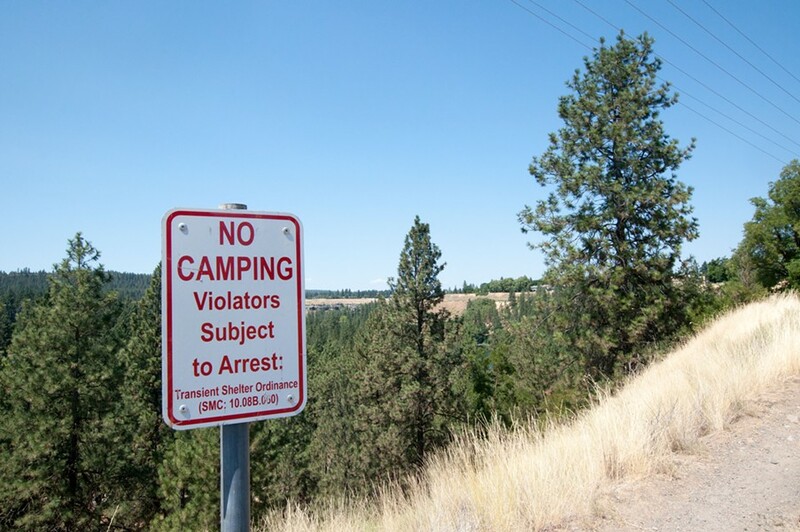 "He made the suggestion that we more clearly mark the 'no-camping' [area,]" Torok says. 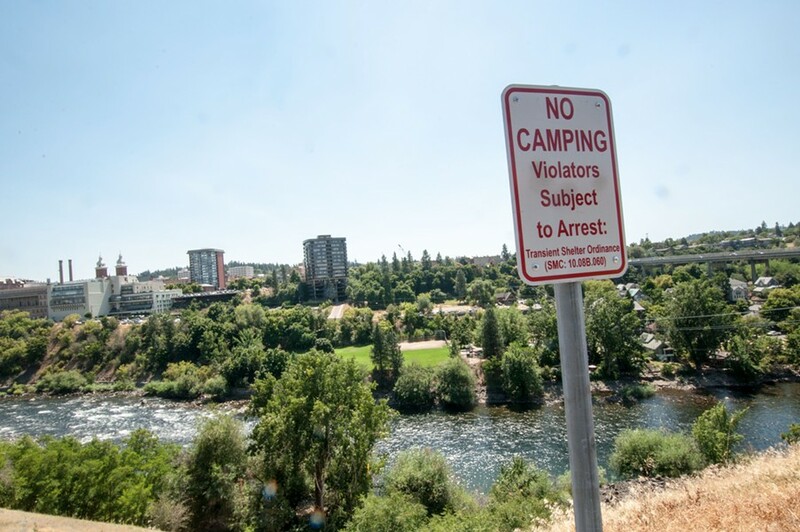 Generally, if people are camping on property that doesn't belong to the city — for example, on railroad property or a place that belongs to a private owner — the city may notify that owner and tell them it is their responsibility to move people and remove any litter left behind. Those owners can ask for police assistance, or in the case of the railroad, BNSF has its own private police force that handles those trespassing cases. For the city's neighborhood services code enforcement, the homeless outreach team is sent first, to make contact with people and let them know about options, says Melissa Wittstruck, a neighborhood and housing specialist with the city. People are usually given 48 hours notice to move. If there's an actual no-trespassing sign posted, Wittstruck says, notice isn't required. "Some of those are up under I-90, and some are on parks property," she says. 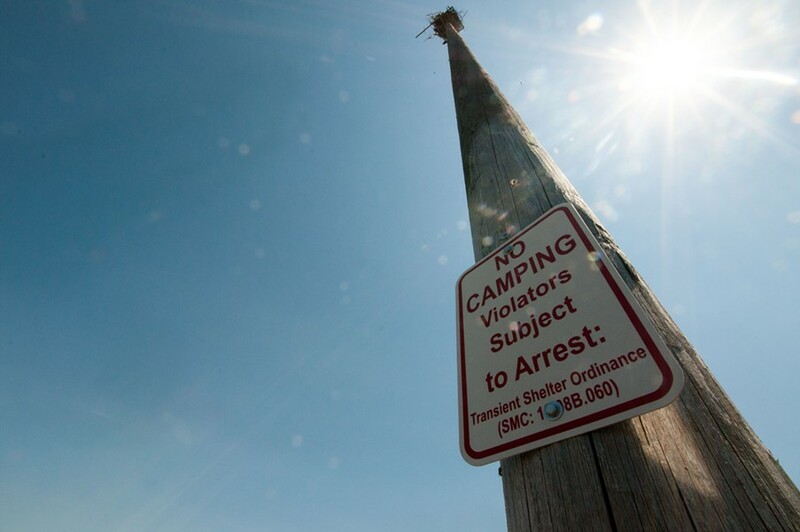 Torok says that there's another ordinance that applies against camping in a park overnight. 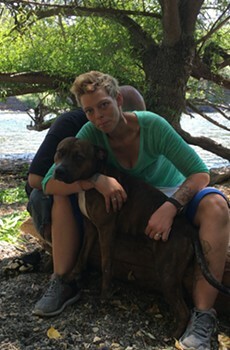 "If somebody had set up a camp, they’re staying there overnight," Torok says. "I don’t have to give them a 48-hour notice." 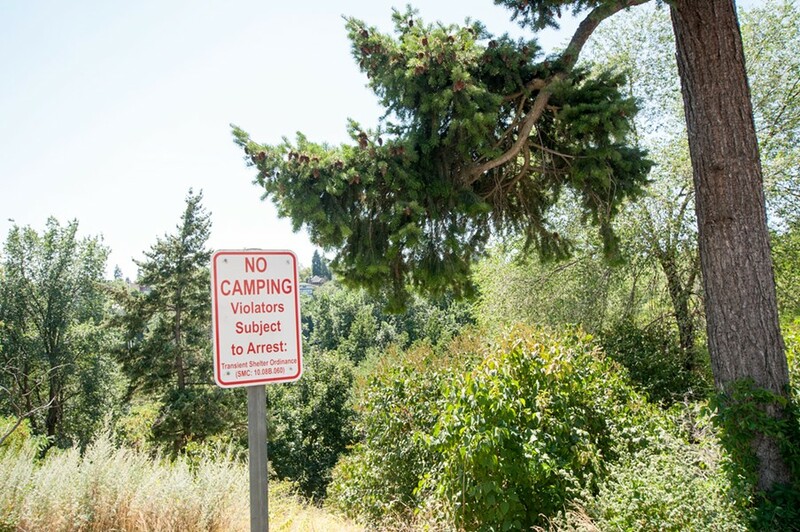 Theoretically, Torok says, camping in a city park overnight can earn you a $513 ticket, but cops will rarely enforce the financial penalty. "There’s nothing to be gained by doing that. It starts a whole process," Torok says. "It’s a ticket they can’t afford." Instead, he says, police concentrate on trying to connect campers with services. 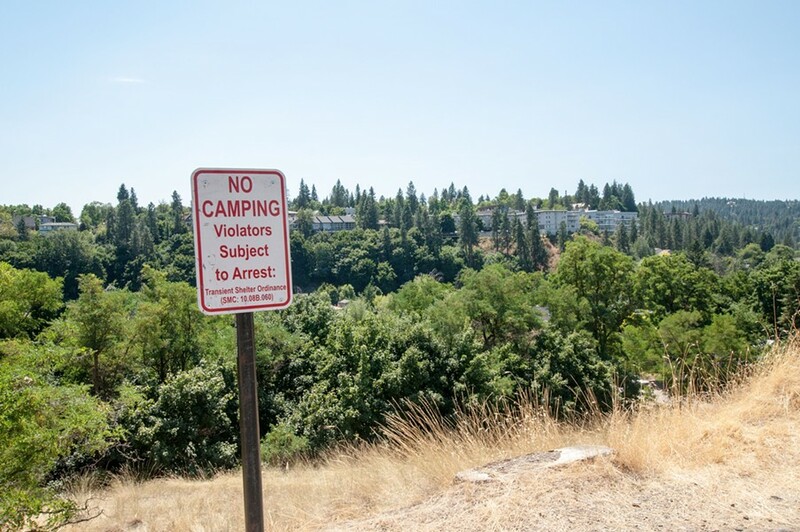 He also says that on park land that is not clearly defined as park land, Torok says the police department will still likely give campers 48 hours notice to vacate. 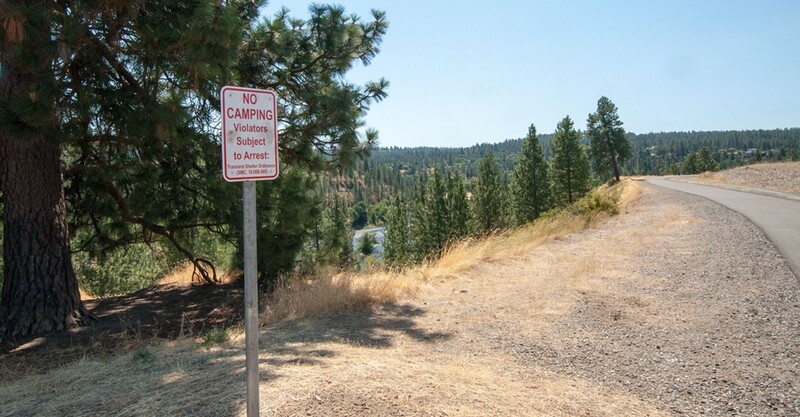 Mallahan says it's likely that additional "no camping" signs are going to go up. 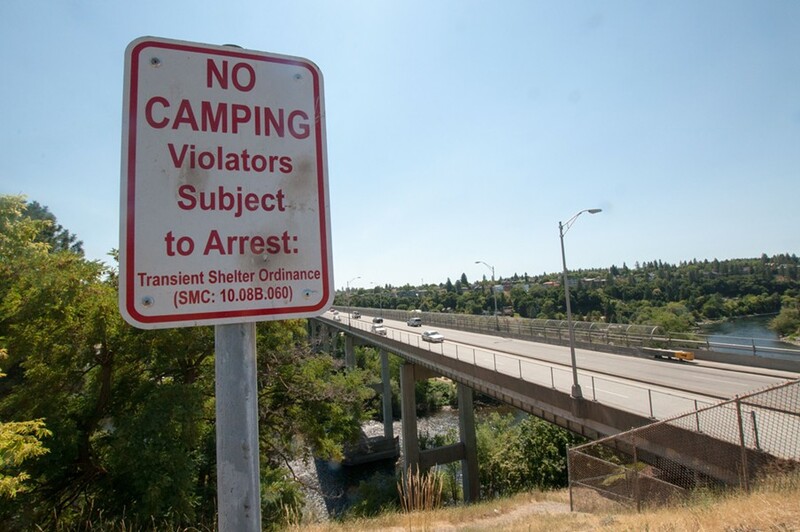 Spokane Homeless Coalition Chair Ryan Oelrich, however, says that such signs appear to be of limited effectiveness when it comes to dissuading homeless campers. He notes there are similar signs along Riverside Avenue. "I jog through there, and I still see camps and folks," Oelrich says. Some homeless men and women may choose not to sleep in a homeless shelter, for a variety of reasons. 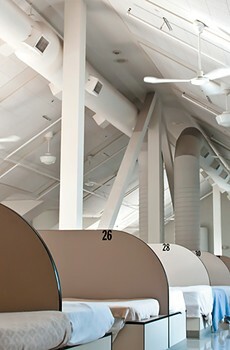 Some may be experiencing mental illness or trauma that makes sleeping in close quarters with other people difficult. "It’s a very stressful place for them," Oelrich says. Anecdotally, Mallahan says, it seems like there have been more homeless encampments this year than in prior years. "We did see an uptick in the number of homeless during the point-in-time count," Mallahan says. Initially, the city believed that was largely because the 24/7 shelter model made it more easy to find and count homeless people, but the apparent rise in homeless camps suggests there may be a real increase in overall homelessness. Mallahan outlines an effort to more quickly shut down homeless camps. "We’re working toward hiring additional temporary staff members to help us quickly respond to those encampments," he says. "We're trying to grow our capacity to make sure we're getting out there so we can take care of these right away." At times, he says, the camps can pose a fire a hazard. 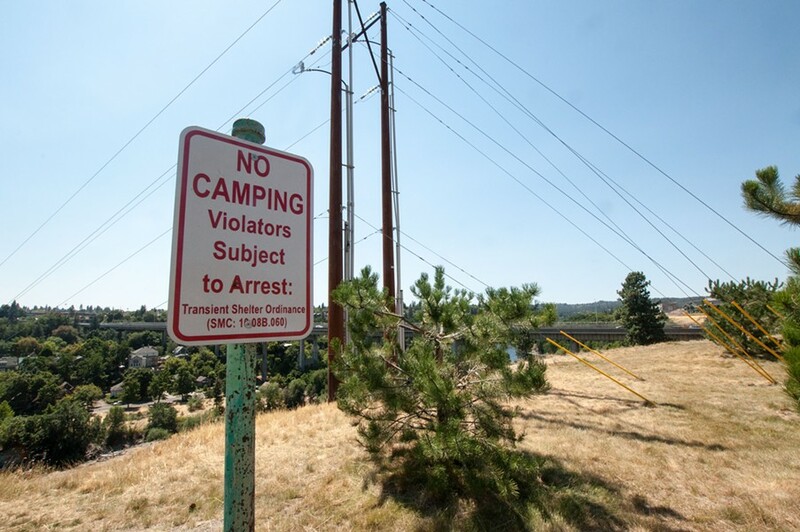 "When you’ve got someone down at the lower end of that embankment, a lot of the hillside is covered in dry weeds and dry grass and brush," Mallahan says, referring to the camp below Kendall Yards. "It’s important that we make sure we don’t have encampments down there." 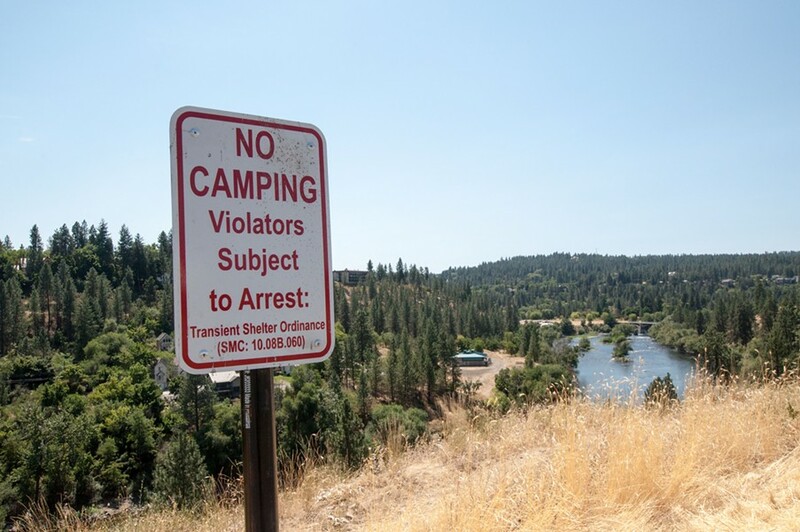 Shortly after the people living at the camp below Kendall Yards left, volunteers and workers cleared out about a ton of personal belongings and garbage, the Spokesman-Review's Jonathan Glover reported. Mallahan also says he wants to make sure that the city responds to the camps with sensitivity. "We offer services for space in the shelter before we go in and clean those encampments," he says. "Our approach is to make sure we first have the conversation, share the information about the law." Mallahan says that starting on Aug. 1, the city will again be able to offer 24/7 shelter to any man or woman who needs it. He says the shelter provides storage space for some of their possessions. Mallahan says the city is looking to other cities, to see how they handle homeless encampments. He notes that Boise, for example, puts the unclaimed possessions of a homeless camp in a series of clean bins, giving the evicted campers time to claim their stuff before it's thrown away. Oelrich says he's visited homeless camps in Portland, Seattle and Salt Lake City, and seen firsthand "both sides of the coin." Ultimately, he says, both shelters and homeless camps have their problems. He believes the best solution is permanent housing. Additional reporting contributed by Samantha Wohlfeil.